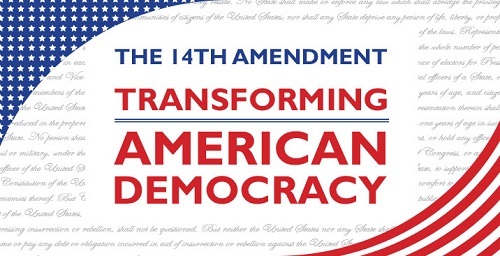 The 14th Amendment: Transforming American Democracy is the 2017 Law Day theme chosen by the American Bar Association. The ABA notes the following about the 2017 theme, "The 2017 theme provides the opportunity to explore the many ways that the 14th Amendment has reshaped American law and society. Through its Citizenship, Due Process and Equal Protection clauses, this transformative amendment advanced the rights of all Americans. It also played a pivotal role in extending the reach of the Bill of Rights to the states. Ratified during Reconstruction a century and a half ago, the 14th Amendment serves as the cornerstone of landmark civil rights legislation, the foundation for numerous federal court decisions protecting fundamental rights, and a source of inspiration for all those who advocate for equal justice under law."